What do you think, Grover Norquist? A bunch of Republican candidates are running around the Granite State accusing Herman Cain of backing tax hikes with his 9-9-9 plan. Is 9-9-9 a tax hike? 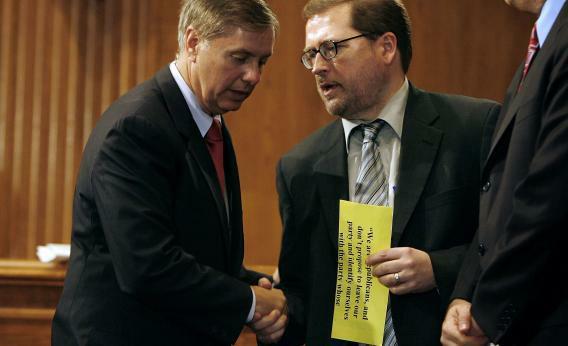 “I don’t believe so,” says Norquist. “The guys who created it – I’ve talked to Rich Lowrie, who helped design it – believe they created it to be revenue neutral. They’re not trying to raise more revenue with taxes.” That’s key, because the long-term purpose of Norquist’s tax activism, the so-called “starve the beast” plan, is to deny Washington the revenue it needs for more spending.